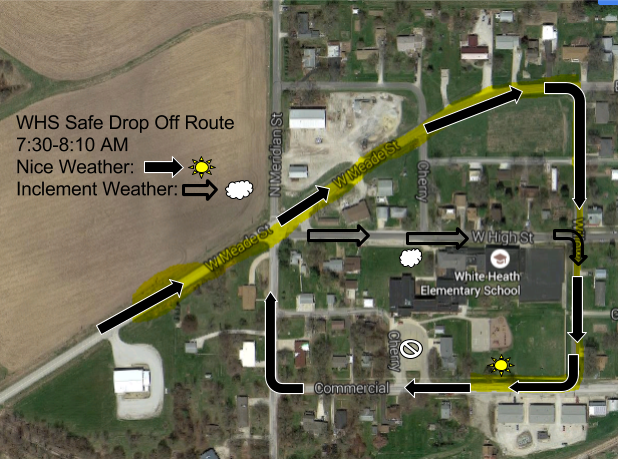 Please use this map as a reference for the safest possible drop off route at WHS in the morning. Please stay on Old Route 47/Meade Street past WHS, turn right on Willow Street, turn right on Commercial Street, drop your student off at the playground gate, and continue west on Commercial Street. If it is rainy, please drop your student off in the front of the building on High Street near the White Heath School sign. If you pick up your student from WHS after school, please do so on High Street in front of the school. Two teachers will be outside to supervise and help students.